To confirm the phytoplasma association in 13 sugarcane white leaf (SCWL) symptomatic samples collected from Puer, China, nested PCR assays with phytoplasma universal primer pairs was performed. A ~ 1240 bp product was obtained from 10 out of 13 symptomatic samples, and 16S rRNA gene sequencing results showed that all sequences of SCWL isolates were 100% identical to each other. BLASTn analysis revealed 100% sequence similarity with the 16S rRNA genes from SCWL phytoplasma strains LC7 and LC9 from Lincang, Yunnan province, China belonging to 16SrXI-B subgroup. Virtual restriction fragment length polymorphism also confirmed that Puer SCWL strains were member of the 16SrXI-B subgroup. 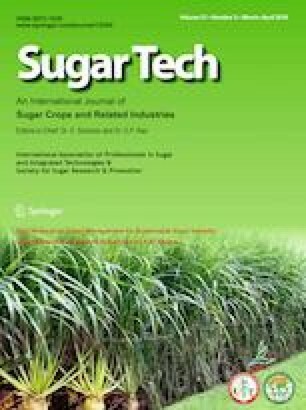 This work was supported by the National Natural Science Foundation of China (31760504), Yunnan Agricultural Foundation Projects [2017FG001(-054)], the Sugar Crop Research System (CARS-170303), Yunling Industry and Technology Leading Talent Training Program “Prevention and Control of Sugarcane Pests” (2018LJRC56), and the Yunnan province Agriculture Research System (YNGZTX-4-92). RYZ analyzed the sequences and wrote the manuscript. WFL, XYW, JL, HLS, XYC, ZML, JY performed the experimental work. YKH conceived and designed the study.